The SNAIL SHELL SYSTEM is a low cost system that enables persons to move around, change their whereabouts and live in various environments. One unit supplies space for one person. It is mobile both on land and water. One person can move it slowly, either by pushing it like a wheel, walking inside it or on top of it On water it can be rowed, moved by a kite or hooked up to a vessel, for example, a ferry. The unit rests on one flat side and can be anchored in lakes, rivers, harbours or at sea. On land, it can be placed in city spaces, fields, forests etc The SNAIL SHELL SYSTEM takes up very little space and can easily be placed in a discreet way. It can be buried in the ground, exposing only the entrance. It can also function as a comfortable space inside existing buildings Several units can meet up and form temporary communities The unit can be hooked up onto existing infrastructure like telecommunication lines and electricity cables (for example, by connecting it to street lamps). If special devices are added, the unit can supply its own energy The SNAIL SHELL SYSTEM can also be used for transporting different items and it can provide protection for persons when they participate in situations like demonstrations. The SNAIL SHELL SYSTEM is constructed from a cylindrical polyethylene tank. 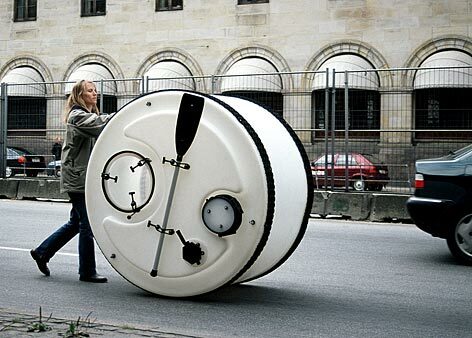 The tank was chosen for its non-toxic material, low weight and its ability to roll. A spherical tank would also work, but standard tanks of that shape are rare and expensive. Various devices are attached to the tank, adding different functions. Caterpillar tracks of rubber are fixed to rubber knobs on the tank. They protect the tank during transportation, add friction and make it easier to steer the unit. They also function as protective fenders when the SNAIL SHELL SYSTEM is moored. The caterpillar tracks can be removed. 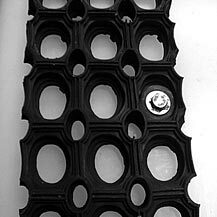 On one of the flat sides, a small and a larger hole perforate the unit, and function as an air intake and entrance respectively. A removable lid covers the entrance, which when left half-open also supplies air, while keeping rain out. Whenever a person is inside the unit, it must be left either halfway or fully open. 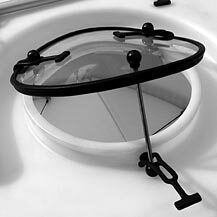 The air intake provides a constant supply of fresh air Three eyebolts, fixed to the surface, function as points to which the unit can be moored on water or whenever it is exposed to strong wind. This can be done by using the rope that is coiled up around the air intake. 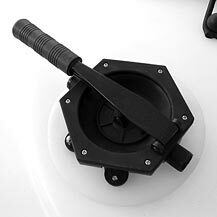 A paddle as well as a hand bilge pump is attached to the unit. The bilge pump can be used for supplying fresh water or for removing water or other liquid. It also functions as a vacuum cleaner. The bottom is covered by a foam sheet that insulates the unit and also functions as a mattress Fixed to this is a box which contains equipment for cooking, a container for drinking water, a torch, a sponge for removal of condensed water, and a tube which can be fixed to the bilge pump. When the box is emptied of these items, plastic bags can be fixed to the box, which then functions as a toilet seat. Because the materials are not fireproof, cooking must be done outside the unit. 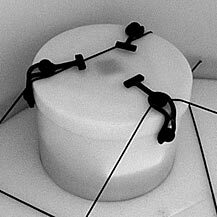 Elastic strings at the bottom hold the foam mattress in place and can also be used to secure the box as well as other items during transportation of the SNAIL SHELL SYSTEM. All kinds of extensions can easily be made to the system. More equipment can be made to fit inside as well as outside the unit. Insulating material can be strapped onto the surface (or insulating material like snow, leaves or earth can be piled up around it) Devices like dynamos, solar panels, wind mills, etc., can be added so the unit supplies its own energy Links to combine several units can be attached. Polyethylene can not be glued to other material so all extensions must be fastened e.g. by lashing or screwing. Care must be taken not to damage the plastic or perforate it in ways that could cause leaks. The caterpillar tracks are made of rubber doormats. 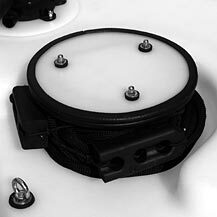 They can easily be removed by lifting them off the rubber knobs to which they are hooked. The lid can be opened either halfway or fully. When a person sits inside the unit, it should be left at least halfway open for better ventilation. The lid rests on a steel rod. The rod can be used for lifting the unit from resting to transportable position, by threading it through one of the eyebolts. The air intake provides a constant supply of fresh air while keeping rain out. The chocks can be put under the caterpillar tracks whenever the unit is temporarily parked. The rope is for mooring the unit on water or securing it on land. The bilge pump can be used as a vacuum cleaner as well as for pumping water. Combined with hoses and a flexible tank, it works as a shower. The box contains a torch, hoses for the pump, kitchen pan, kettle and alcohol burner, foldable water containers that can be used for ballasting as well as for shower and drinking water, and plastic bags. 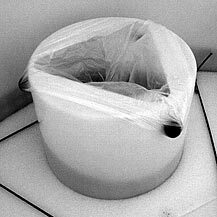 A plastic bag can be folded over the knobs whereby the box can be used as a toilet.